The Grand CARRERA Calibre 36 RS Caliper Chronograph CAV5115.BA0902 has the elegance of an Italian race car. In a brilliant collaboration of form and function, the TAG Heuer Men’s Grand CARRERA Calibre 36 RS Caliper Chronograph CAV5115.BA0902 is first mechanical automatic chronograph able to measure and display 1/10th of a second. First introduced as a concept watch in 2008, it won immediate international accolades and awards, including the prestigious Grand Prix de l’Horlogerie de Genève, The Most Successful Design Award in China and was critically acclaimed at Mexico’s Salon Internacional de Alta Relojeria. This stunning timepiece epitomizes the spirit of Grand Carrera and TAG Heuer motor racing heritage. Like its namesake, the legendary Carrera Pan-American, the racing world’s most grueling road test, the Grand CARRERA Calibre 36 RS Caliper Chronograph is built for split second precision and endurance. The Grand CARRERA Calibre 36 RS Caliper Chronograph CAV5115.BA0902 has the elegance of an Italian race car, and indeed the timepiece’s dial could easily be at home on the dashboard of such a high performance car. In fact, the concept version of the watch was. Japanese Car Designer Ken Okuyama who designed the legendary GT cars, Ferrari Enzo and Maserati Quattroporte, mounted the Grand CARRERA Calibre 36 RS Caliper Concept Chronograph on the dashboard of his ultra sleek concept car the K.O.7. Housed in a stylish fine-brushed steel case with curved faceted polished horns, the black dial accentuates the Calibre 36 RS two rotating systems decorated with “Côtes de Genève” and polished facets. More features include chronograph minutes at 3 o’clock, chronograph hours at 6 o’clock, and linear seconds at 9 o’clock. An oversize crown with red line at 10 o’clock allows the wearer to use the Caliper Rotating Scale that provides a precise reading of 1/10th of a second – magnified 10X! The Grand CARRERA Calibre 36 RS Caliper Chronograph CAV5115.BA0902 as shown comes with a three row multi-faceted steel bracelet strikingly finished with an alternating polished and fine-brushed central row and fine-brushed lateral rows with polished edges. A black rubber strap with fine-brushed and polished steel end piece is also available. 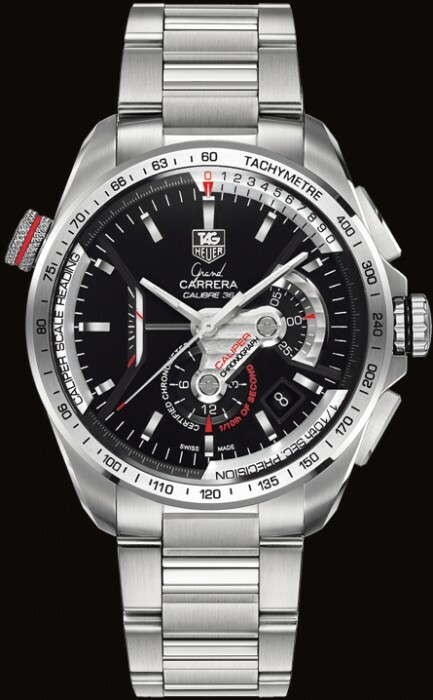 Other features: a double anti-reflective curved sapphire crystal back sealed by six screws, the fine-brushed and polished bezel with tachymeter scale, polished hands with polished facets, water-resistance to 100 meters, and a hand applied TAG Heuer logo exemplify the workmanship you expect from a watchmaker as committed to perfection as TAG Heuer. All of this combines to create a watch of dazzling looks and searing performance. In short, a watch that’s legendary. Great style and swift structure – this piece was a breeze of technical information: you did a nice job of keeping the subject interesting. I really enjoyed this.